In 2008, two of our passions (beer and farming) collided in a wonderful experiment! 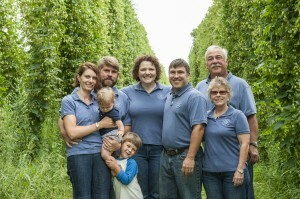 At a time when our farm was in need of diversification, we saw an opportunity to start growing products that make for really great beer: hops and grains! So we planted a 3/4 acre hop yard with little more than the strong desire to grow hops, a love of craft beer and a firm understanding of how to be good farmers… What do you mean these things don’t come with instructions?!? We’ve had to be creative in our approach to growing hops from the very beginning; including everything from hop yard design to building our own equipment for harvesting, drying and packaging. While we’d never say that our foray into hops was easy (more like: hard, costly, humbling, time consuming and terrifying) we’ve gained so much insight and knowledge that we can now stand proudly in the middle of 17 aromatic acres worth of our own hops! We love what we do and it’s great to be hitting our stride in production, relationships with brewers, and quality. As we’ve continued to grow, we’ve become a regional supplier of hops to breweries across New England: wet/fresh hops, whole leaf cones, and pellets. Want to learn more about the Local Craft Brewing Movement? 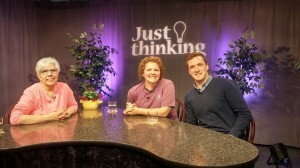 We had the great opportunity to speak with Mary Greendale (of Just Thinking) and Chris Sellers (of The People’s Pint) about the return of hops to New England, how beer is made and the new opportunities created, thanks to invested craft beer drinkers, for farmers and brewers to work together to make new, local, terroir-based brews. Click on the image to the left, to view the whole story. Thank you to CISA for including us in this great segment about the local craft brewing movement. This clip gives you a tour of our hops operations and lands you in the capable hands of Donald Patcher (head brewer of the Northampton Brewery), as he discusses the process of brewing with local ingredients.